Back for more, Freddie? A glutton for punishment, are you? Well, if that’s the case I admire your resolve to stick with it and take your lumps. But it’ll be hard to muster up any enthusiasm for another entry after the disjointed mess that made up your first effort in the rock realm yesterday. But I suppose “If at first you don’t succeed…” caught on as a saying for circumstances such as these. Far be for us to write you off entirely after one epic misfire. No man’s life or career should come down to only one moment, no matter how good or bad that moment was. Everybody has earned the right to have the full spectrum of their achievements weighed and measured in proper balance. So we’re wiping the slate clean for you, Mr. Mitchell. We’re not completely forgetting how awful your last attempt was, after all in music one song builds upon another to state your case as an artist, but we will put that regrettable offering aside for now and gamely accept the challenge of addressing the flip side of that record with an open mind. But for anyone in our reading audience who takes undue pleasure in beating a dead horse we’ll helpfully mention that the review for the offending (or is that “offensive”?) Slider is always just a click away! Before we even press play we’re greeted with something that will at least bring a smile to your face when we see the title of the song is The Derby. As instrumental titles go it’s nothing special unto itself but this is intentionally clever because it is appearing on the very first release for the new Derby Records label. Rather than coming off as merely cloying – as would happen in the future far too often when record titles on insignificant labels were often used in tandem in the most ridiculous fashion to draw attention to their inferior product (Corvette by The Corvettes on Corvette Records anyone?) – this shows a modest amount of whimsy on their part. In life we give points for originality if nothing else and so The Derby has to get credit for that early on before the actions of others down the road turn that credit to blame for instigating a trend that did nobody any good, turning releases into gimmicks rather than musical ventures. Besides, as we’ve documented with some depth in the past, there has to be some imagination shown when it comes to naming instrumentals since the songs have no lyrics to draw from when seeking a title. We’ve frequently seen them named after radio dee-jays designed to get the records additional spins on the air, which is nothing more than shameless pandering or payola, so this idea at least is more tongue-in-cheek and not quite as odious as all that. Of course the name of the song will be the least of Derby Records’ problems if the musical performance captured on said record is as harsh and unappealing as it was the last time the needle fell on the other side of this single. 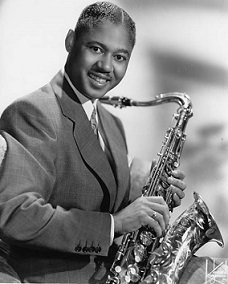 Since the label was tied to Freddie Mitchell in more ways than one, as he wasn’t only their primary artist but was also the man they’d hired to oversee their entire output as the leader of the house band which he himself assembled, their fate as a company would be resting on his ability to deliver the goods musically. If the only thing their potential customer would be getting after spending seventy-nine cents on their product was a quick grin at the title of a record then the whole enterprise wouldn’t last very long. The many problems detailed in the review for Slider (it looks odd without a “The” on the front end of it for some reason, though it really shouldn’t) centered around the fact that none of them showed much ability in their playing. It’s unlikely that they COULDN’T play better than a 5th grade school band after just one rehearsal but if they could they hadn’t shown any real indications of that ability. The record was dominated by a dissonant sound, sounding as if they hadn’t even bothered to work it out in advance, or perhaps thought it was a merely run-through before they had the tapes rolling. The criticism against rock was often that it wasn’t very melodic, but that was usually snobbish dismissal of the entire style rather than a pointed critique of a specific record’s attributes. Not in this case however. Yes it’s true in rock music that melody often took a back seat to rhythm and frequently, especially with sax-based instrumentals, it could be subverted to a degree in their efforts to whip up some excitement, but rarely do you hear songs that had absolutely no clue as to what the melody was supposed to be and yet carried on obliviously all the same. But Mitchell had been a valued member of the bands of some major stars in the jazz world and it’s doubtful that he’d have been hired in the first place, let alone that he’d have been allowed to stick around long, if he were incapable of playing his instrument properly. So we have to chalk that first side up to just not being fully aware of the requirements of rock, at least as it pertained to sounding unhinged while still being in key, on point and all heading in the same general direction. Therefore it’s somewhat of a relief to hear them all on the same page to kick off The Derby even if the sound is rather tame, harkening back in a way to a big band motif. Everything falling in line, very orderly with horns modestly churning as the drummer does just enough to be heard and keep things on track without drawing undue attention to himself in the bargain. Unlike the flip side there’s not a note out of place, so much so that you think to yourself that this must’ve been the first side cut that day after which they recused themselves to the local bar and came back three hours and 15 drinks apiece later before launching into the next song. But no, that’s not the case at all, this was cut immediately after Slider according to the session sheets, so that leads you to think the first song featured an entirely different set of musicians, maybe a standby group who were on hand in case Mitchell’s outfit didn’t show up or something. Wrong again, these are indeed the same guys, Slim Moore on trombone along with Mitchell and Bill Graham, who wrote this, on saxophones with Joe Black holding down the piano chair along with a drummer and bassist too shy – or embarrassed – to use their names. Yet once we get over the fact this is played with a degree of tight professionalism not seen the last time out we have to confront the fact that in spite of its vastly improved musicality it still isn’t entirely suitable in the rock arena. Don’t get me wrong, older swing rooted charts make for perfectly good music… just not for rock attuned listening. But considering the alternative we were presented with yesterday we’ll be a bit more forgiving about being taken a few years in the past for this ride. If this is all that The Derby is shaping up to be, even if it does change our view on the abilities of the musicians at hand, chances are it wouldn’t have made the cut here on Spontaneous Lunacy. Furthermore if this was the brand of music Mitchell found he was more suited for and began to lean back in this direction with increasing frequency then he probably wouldn’t qualify as a rocker for very long. But you know by the mere fact this IS included here that something is about to change as the record goes along and if the first full minute has you picturing a dance at a USO Club during World War Two the next two minutes hurtles you back into the present day and the musical landscape of June 1949 where it’s rock ‘n’ roll that has you in its grip. Mitchell pulls out of the subdued elongated intro with some comparatively impassioned playing, still nothing to rival the likes of Earl Bostic or Big Jay McNeely mind you, but at least something that can proudly stand amongst them in a crowd shot without having to explain his presence. It’s also far more melodic than what he’d shown last time around, offering up some nice twists and turns along the way, giving his passages room to breathe as the others keep modestly riffing underneath him, unobtrusive for the most part until he takes a breath and then their presence is more noticeable but certainly not out of place. None of this is scintillating stuff by any means though, no matter how modestly appropriate it may be for rock circles. There’s no dynamic blowing to be found within, no hypnotically undulating riffs, no radical approach in the arrangement designed to highlight something completely gonzo in its intent. But it’s also not shying away from the main requirements of rock instrumentals which is to offer something catchy and danceable while exhibiting a sense of emotional freedom by virtue of some fairly enthusiastic playing. It succeeds on all of those counts – barely maybe, but succeeds all the same. Even when the group returns to the forefront for a brief spell before Mitchell yields to Graham on baritone to close things out, which musically is the least compelling part of this, they wind up throwing another surprise your way in how they fade the record out as opposed to wrap it up with a traditionally written capper. Now in 2018 that tactic is hardly big news but fading records out like this in the 1940’s was unheard of. The first time we encountered it was with Wynonie Harris on Good Rockin’ Tonight, presumably because he was unzipping his fly to start rocking with a girl he pulled into the studio and the producers didn’t want to be hauled into court as witnesses if the record was used as evidence when he faced formal charges for engaging in such debauchery so they faded it out of the final mix, starting a trend that would soon be universal. But that was the only time we’ve seen it to date thus far and even then it was rather subtlety done. Not so here when the fade is stretched out and actually lasts quite awhile, maybe because the band just kept going and the record would’ve been too long to put out as it was and so they found the most suitable spot to end it but had no choice but to fade it if they didn’t want to cut them off cold in mid-note. Who knows though, they might’ve reverted back to the calamity on the other side of the record and started missing notes left and right so they ended it before they were all accused of being completely talentless. Since we don’t know which of those options was the case we can only accept it for what it is, which means a gradual easing off on the mood as night falls. An appropriate ending for a fairly pleasant, but hardly gripping, performance. No matter your relief that this turned out as restrained as it did in comparison to the blaring chaos on the top side you still can’t claim that The Derby was even an average rock release, certainly not in the high stakes category of the tenor sax instrumental circa 1949. But that said it does manage to fit in fairly comfortably with the better heeled records in the field and also gives notice that with a little more practice, a bit more foresight and some higher aspirations all around that Freddie Mitchell and company make yet make a go of it rock ‘n’ roll. Not every artist has what it takes to be a superstar, but what’s of equal, if not greater importance for rock’s long term survival is to find enough willing and able artists to keep perpetuating the music at a reasonably competent level so that it gives those better suited for stardom a bigger stage from which to be heard. 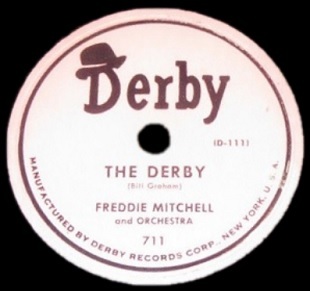 Derby Records throwing their hat into the rock ‘n’ roll ring helps in that regard, providing one more outlet for the dreamers and wanna-be stars to make their play for the jackpot, and while Freddie Mitchell still might not be likely to make this pay off, with this he’s at least shown he’s sincere in his efforts. I’m torn over this one. The opening theme is my favorite segment of this record. Unfortunately, that theme’s the most outdated aspect of this record (I’m a little surprised that some big-band around this time didn’t appropriate it). Mitchell solo is also nice, though I get the feeling he’s struggling a little to maintain the grittiness in his horn’s tone. Anyway, the performance here is competent, which is more than we can for the other side of this record. Leave a reply on "Freddie Mitchell: “The Derby”"